« Scarf! Shawl! Kindle! Busy! This week has been slightly less packed with adventure than the last few weeks, although there has still been plenty going on. Overnight on Saturday we looked after Gethin, as planned. That boy is just so cute! He is happy and smiling almost all of the time, which makes it so easy to look after him. Plus, he has the best sleep routine I have ever seen in a 5 month old…we gave him a bottle and changed him into ‘jamas at 7-ish, we read him a story, we put him in the travel cot, walked away…shut the door…didn’t hear a sound from him until nearly 9am the next morning 🙂 ! And apparently that is his normal routine. He just goes to sleep by himself and sleeps right through. Now that is the kind of babysitting I can cope with! Anyway, the main reason for looking after the Baby was to give Sam a break and it worked. She slept for nearly 12 hours uninterrupted and didn’t wake up until almost 11am. I’m glad, she obviously needed it. Also this week I’ve been for a doctor’s appointment myself, and taken my Mum to the hospital for the first of several angina tests. We’ve finished out shopping for Christmas – all the presents, wrapping paper, most of the food. We just have a few bits and pieces to get fresh at the last minute. 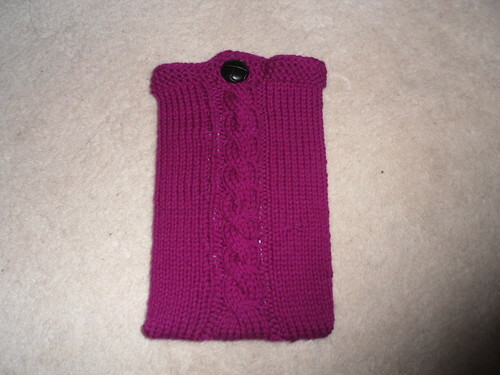 A knitted cover for my Kindle. I’ve taken it out with me several times this week, and it’s really convenient. On Friday I was early for my appointment with the doctor, so I sat in a cafe and read my Kindle with a nice hot coffee. I then sat in the doctor’s waiting room reading it when the doctor was running late. It’s so slim and lightweight, it easily fits in my bag and doesn’t feel uncomfortable to hold and read. I even read it on the bus on the way home. This knitted cover is just to protect the screen from scratches. Yay! 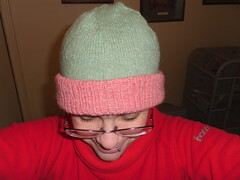 It’s pink on one side, green on the other! It’s really warm, which is great at the moment…it has been freezing cold and snowy for a week or more. I have also started a new pair of socks and a scarf for myself, but those may have to wait as I have had special requests from Mum and A. Mum has no heating at the moment, so she is really cold. For some reason it is her ankles feeling it most, so she wants leg-warmers. How very eighties! A, on the other hand, has been asked to wear a Christmassy hat when he works on Christmas eve. He doesn’t like the cheap santa hats we could easily get hold of, oh no, he wants a custom made one. He is at least thinking practically – if I can make him a plain red hat with a white brim, then add a detachable pom-pom to the top, he can take off the pom-pom and wear the hat after Christmas, just to keep his head warm. It makes sense, but that’s two projects with very short deadlines…plus I have a few baby gifts to make…plus I really wanted a new scarf myself. So, this week coming up…not a lot at the moment. We’re off out tonight with Alan and Kat, for dinner in a nice Italian restaurant. Tomorrow we may be taking a nephew out for his birthday. On Tuesday we might look after Gethin again, so David and Sam can go to the cinema. But that’s it. Oh, and one more thing – how cute is this?! 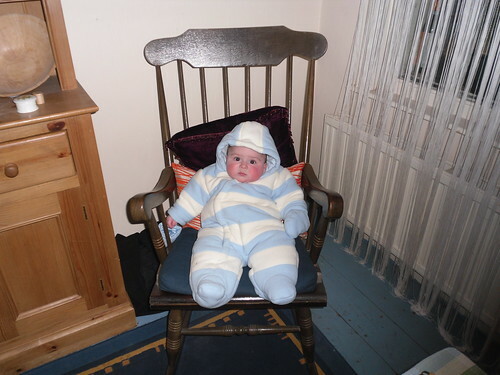 This entry was posted on December 4, 2010 at 12:15 pm and is filed under Baby, knitting, Mum. You can follow any responses to this entry through the RSS 2.0 feed. You can leave a response, or trackback from your own site. I just found your blog while searching on “The Gibbie Shawl.” I saw your archived post in October. Did you end up making the shawl? I have the kit and am about to get started. Best regards from Maui, Hawaii. 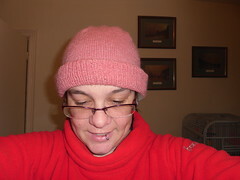 If you read back over the previous few weeks’ entries, you can see more entries about my progress as I was knitting it. 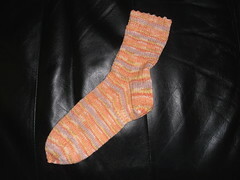 There is also info on Ravelry – are you a member? I’m on there as UncoolHelen, would love to add you as a friend.